The start of round five in Shamkir. | Photo: Shamkir Chess. Scoring his second win, Vishy Anand is now tied with Sergey Karjakin in second place at the Gashimov Memorial in Shamkir, Azerbaijan. David Navara scored an upset win vs Ding Liren, and Alexander Grischuk defeated Veselin Topalov. Magnus Carlsen remains in the tournament lead. Today, at the press conference Anand was asked why he is still playing at the highest level, while most of the players from his generation have either quit chess or are much less successful. Was it his labor, or his talent? Even an always-modest Anand could only agree there. With a big smile he reacted: "Anish nailed it!" Anand discussing variations with Giri on a computer. | Photo: Shamkir Chess. "I think Vladdy could have gone on if he wanted. With a little less optimism he would have been fine! Of course I'm joking; he could have gone on for a bit longer. He had a few bad results but even last year wasn't a bad one for him. "It's not like I'm the only guy. Boris [Gelfand] is still also kicking. Vassily [Ivanchuk] is still there. OK, my results are a bit higher in classical but I think Boris is already passing me in rapid so it's all over the place." Anand, world number-six at age 49. | Photo: Shamkir Chess. Today Anand scored his second win, and it was Giri's second loss. The Dutch grandmaster "blundered" (top GM slang for "missed") two moves from his opponent, and that was enough to get into a hopeless position. Anand: "I was also surprised how good my position got so suddenly." Anand's second win was Giri's second loss. | Photo: Shamkir Chess. The round saw quite the upset as the last seeded player, David Navara, managed to beat second-seeded Ding Liren. Last year Navara left Shamkir without a win, but this time he scored a big one. It was his second victory against a 2800 player, after beating Levon Aronian in 2012 in Wijk aan Zee. Not a 2800 anymore, coincidentally today Aronian is exploring other opportunities in life. Navara said he was a bit surprised about Ding's choice of 8...a6 as opposed to 8...Bb7, and noted that the line has more or less lost its popularity since Anand used it brilliantly to retain his world title in his match against Kramnik in Bonn in 2008. Navara beat a 2800 for the second time in his career. | Photo: Shamkir Chess. Just when Navara started to sound like he was aware of all the details in this variation, he added, in his typical humor, "...but of course I didn't remember anything here." The Czech GM felt that the endgame with R-vs-BN should have been a "simple draw," but somehow Ding let his knight to be trapped. Dejan Bojkov explains how. An unexpected loss for Ding Liren. | Photo: Shamkir Chess. The third winner was Alexander Grischuk, but only after a 6.5-hour fight. He defeated Veselin Topalov in a game where, unlike in his fight with Karjakin, the bishop pair was clearly better than the pair of knights this time. "It was very unpleasant, especially the way I played it," said Topalov. "I think almost nobody will beat the computer in this position. Maybe Magnus at his best, Kasparov when he was young...and Botvinnik, because he will adjourn the game!" At some point Topalov seemed to be getting back into the game. Grischuk: "Then I just got outplayed. I started to move around. It's hard to play the same position for two hours." That was the case for both players, and eventually Topalov stumbled. Grischuk also showed up on the Chess.com live server before round four (at 11 p.m. local time) to play in the Bullet Chess Championship qualifier. Grischuk is already seeded into the championship bracket as the number-three seed. Grischuk finished 15th in a strong field in the qualifier, which may have just served as a tuneup for the main event this weekend. Grischuk: "I think almost nobody will beat the computer in this position." | Photo: Shamkir Chess. Magnus Carlsen still leads alone with a plus-two score after drawing quickly with Shakhriyar Mamedyarov. The Azerbaijani GM played the Tarrasch, which he does from time to time. "I was surprised but I wasn't particularly disappointed in the opening because I thought I had a playable position," said Carlsen. 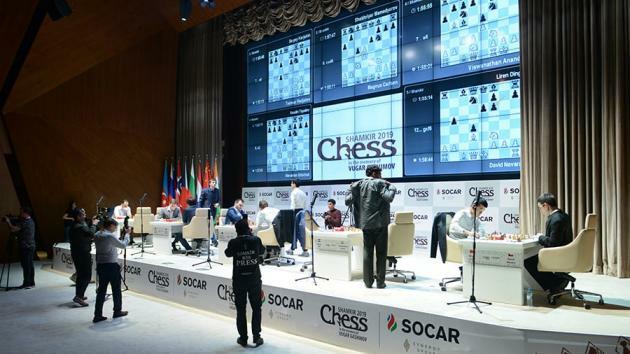 FIDE president Arkady Dvorkovich arrived in Shamkir and played the first move for Carlsen today. | Photo: Shamkir Chess. However, he felt he played too slowly with 16.Rfc1 and 18.Ra2, when Mamedyarov equalized without much effort. That didn't make Carlsen fully satisfied about his first half of the tournament. "For me I feel it's been a bit up and down," said Carlsen. "The score I think is very good; at least shared lead. Today I was not very happy. The result is OK with a draw but I felt that the quality of my play was not very high. I'll try to regroup on the free day and continue. But yeah, the score is good so I cannot complain," he said. For Mamedyarov it was the other way around: "I cannot say I am satisfied with the score but I am satisfied with the quality of my play," he said. It's been "a bit up and down" for Carlsen so far. | Photo: Shamkir Chess. Teimour Radjabov and Sergey Karjakin drew the least interesting game of the day, a Catalan where White was better for about 30 moves, but only slightly. A draw in Radjabov-Karjakin. | Photo: Shamkir Chess.